Members of Jaqi Aru during an event to translate the digital security app, Orbot, in El Alto, Bolivia. Global Voices interviewed Jaqi Aru Executive Director Edwin Quispe Quispe (Front row: third to the right), General Secretary Rubén Hilare Quispe (Back row: third to the right) and President Victoria Gimena Tinta Quispe (Front row: third to the left). Photo by Localization Lab. Used with permission. The author of this story is the Community Manager of Localization Lab. She has worked with Jaqi Aru in the project that translated the Orbot app into Aymara. 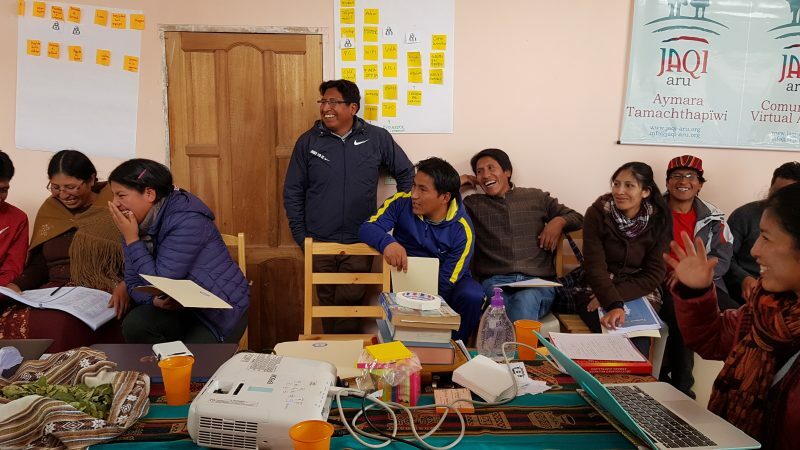 A community of Aymara language activists from Bolivia has translated the digital security app Orbot  to help their community protect themselves online — as well as to make their tongue better represented in cyberspace. Orbot , a downloadable app for Android, creates a private mobile internet connection by encrypting traffic and hiding it by bouncing through a series of computers around the globe, a useful function when accessing private banking information over public wifi or sending personal information online. 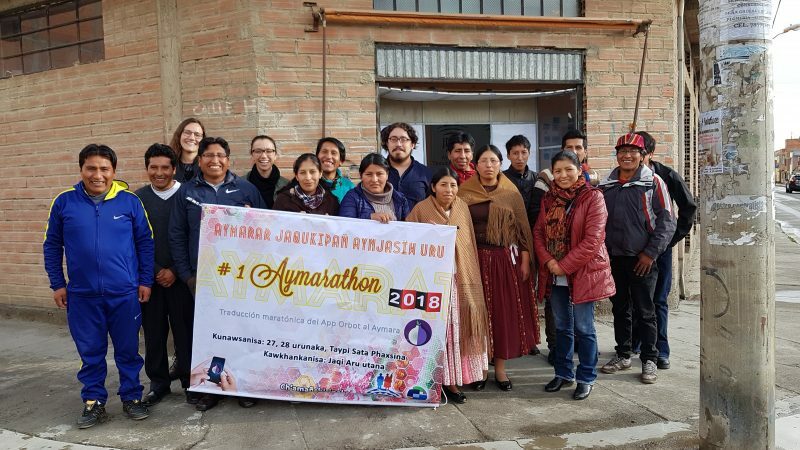 It is the first time this type of app is available to Aymara speakers thanks to Jaqi Aru , a community of volunteers that since 2009 promote Aymara translation and content creation online. The group's past projects include the translation of Facebook's interface, and its ongoing projects include translating articles for Global Voices  and promoting translation and content creation in Aymara on Wikipedia . Every Internet user needs to worry about protecting themselves online, from protecting their passwords to preventing viruses and securely surfing the web. But talking about digital security can be confusing for a lot of us, and adding a language barrier on top of that can mean preventing people from accessing much-needed technology. Aymara  is an official language of Bolivia and parts of Peru and is spoken in northern Chile and Argentina. It is one of the few indigenous languages of the Americas with more than one million speakers — yet, like many minority languages , its online representation is low. La gente quieren saber como protegerse en el Internet y, ahora que tenemos esta aplicación en nuestra propia lengua, podemos empezar a enseñarles como usarla. People want to know how to stay safe online, and now that we have this app in our own language, we can start teaching people how to use it. Many studies have attributed the high rates of school abandonment in Bolivia’s rural communities during the 1980s and 1990s to aggressive pro-Spanish language policies  that alienated speakers of indigenous languages. Centuries of colonial rule by Spain coupled with policies that favored Spanish in educational and institutional settings led to severely marginalized indigenous communities. This meant that indigenous languages were “exiled to the home sphere”  — leaving many embarrassed to speak native languages in public. Recent changes to the education system  have shifted the focus towards linguistic diversity, but speakers of indigenous languages still face disproportionate levels of discrimination  in Bolivia — with serious consequences for the Aymara-speaking people. Although nearly 17 percent of Bolivians  identify as Aymara speakers, the language is considered threatened , with some estimating a 2 percent decline in the number  of speakers every year. Jaqi Aru means “language of the people” or “voice of the people”. Here members of Jaqi Aru collaboratively translate Orbot app into Aymara. Photo by Localization Lab. Used with permission. Casi en la mayoria de los pensum académico de carerras está introducido lo que es la historia cultural andina. A muchos de nosotros nos genera preguntas sobre la identidad. Nos preguntamos, ¿quiénes somos?¿cuál es nuestra identidad? […] La lengua es nuestra identidad. Si perdemos la lengua, perdmos nuestras tradiciones, nuestra cultura, nuestras historias, nuestros conocimientos ancentrales — perdemos todo. Almost every university and study tract includes a course on Andean culture and history. For many of us, this generates questions about our own identity. We ask ourselves: Who are we? What is our identity? […] For us, language is our identity. If we lose our language, we lose our traditions, our culture, our stories, our ancestral knowledge — we lose everything. As rates of Internet penetration continue to rise  in different parts of the world, so does the demand for technology in diverse languages. There is a growing need for “localization ” [now expired], or the process of adapting content to local audiences. Depende de que lengua nace una herramienta, entonces es la que tiene el privilegio y las otras lenguas carecen de su prescencia como es el caso de la Aymara. If a tool is developed in a certain language, then that language is given priority. This means other languages, like Aymara, aren´t represented. The Guardian Project [developers of Orbot app] is really dedicated to making their apps available in as many languages as possible. We have been coordinating the localization of Orbot for a while, and jumped at the chance to collaborate on an event around the Aymara language. Hay gente que dice con menosprecio: ¿pero que tienen en Aymara? [Orbot] es una de esas muestras de lo que podemos hacer con la Aymara. La gente ve y dice, “Wow, la Aymara si tiene lugar en las cuestiones tecnológicas”.